This is what my son interrupted me with the other day. We were at the dinner table and I was going to talk about something that I discovered while working on a project, saying, "While I was working on my sweater I realized something..." And then he said it. He wasn't serious. Please, he's all into video games and anime. We could have a field day with his interests. This is just our family's sense of humor, but we did all pause at the very natural and immediate interjection. When I get back to Texas I'll be ready to dig into the Holla Knits Spring/ Summer Collection. I prematurely ordered some hemp blend yarn to make the coverup/ hoodie with the seahorse immediately upon release. 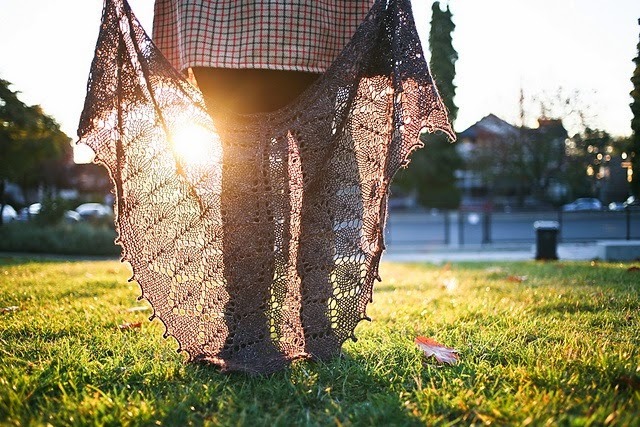 Then there's that elusive first, true lace shawl. It's really time I made the lace stripe tee. I saw everyone and their mother make one, it seems, during the Tops, Tanks, and Tees Knitalong last year. By the way, that knit along helps propel my summer knitting big time. There's also Jennifer Dassau's Slaunter, which remind me of my favorite Urban Outfitters t-shirt. I think it will be super comfortable in Misti Alpaca Tonos Hand Paint Pima Silk. The thing about the Tonos is that's it's got all the color variation you can so easily find in wool yarns, but not so much in a silk/ cotton blend. left off to focus on cool weather projects. I haven't forgotten you little tank top! At this point even I am doubtful about finishing this many projects in three months. So what, there's no pressure right? Waterlily by Meghan Fernandes in Gynx Yarn's Sempervivum colorway. and Riverine by Andi Satturlund in Berroco Weekend Dk. This photo makes me want to go camping every time I look at it. Of course, this tee might very well get ruined and nasty the way we camp, but I can definitely see wearing it everywhere else. And last, but not least, the Austin Tee by Jean Chung in pima cotton. Just kidding, I have one more. It's one I have loved since I first got on Ravelry - this vest from a Phildar magazine. Last year, I happened to find a copy of it on Ebay. I'm hoping Mission Falls 1824 Cotton won't be too heavy for this, because I have some in the perfect color. Ha! I do this all the time. 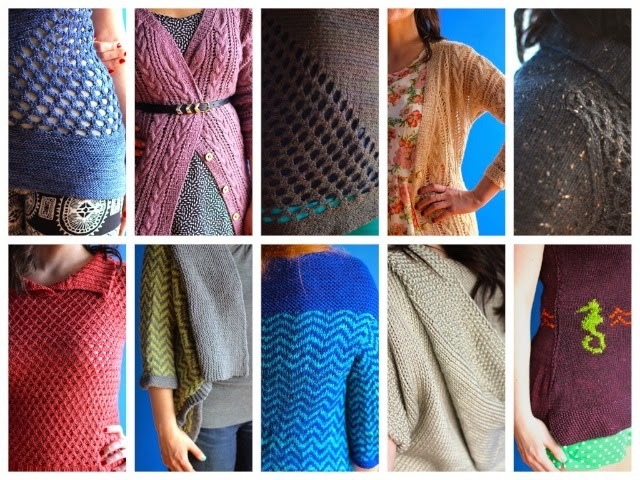 Honestly, daydreaming about what I'd knit with an infinity budget/time is almost as fun as the actual knitting. 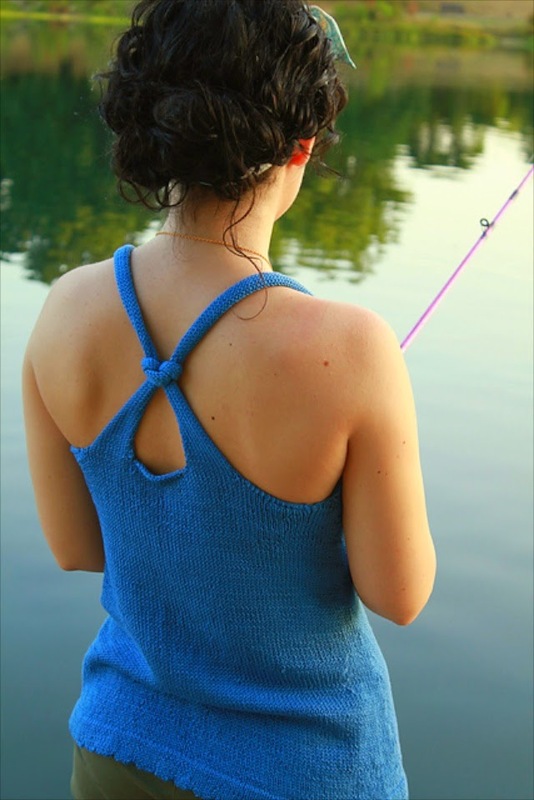 In my head, I will knit three summery tops this year; in reality, I will fully get side-tracked and only knit one, and I don't even mind! 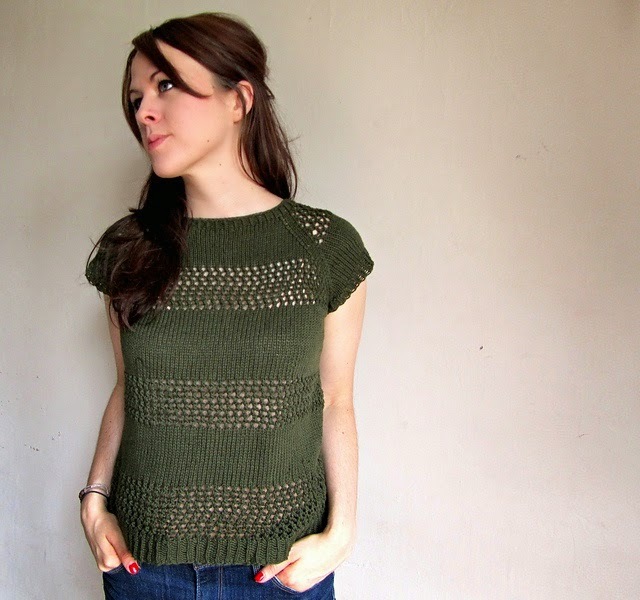 Yay, warm-weather knit-spiration! Yup, I love a good hyphenate. What a list! I'm also a #nolifeknitter, so I can sympathize with the "too many projects, maybe enough time" sentiment, haha. That last vest is amazing! I can't to see it! Well, I doubt that, but it's fun to pretend:). This week we've been on an anniversary camping trip and last night we were talking around the fire about how nice the time alone together has been, but how we miss our conversations with those kids. Now we're really looking forward to getting home. Oh man, you're so far along on Fire Opal! It looks so beautiful! I'm just now really getting started on it, but, yes, I'm looking forward to non-sweaty knits. Hyphenate away!! I know!! I don't know how I even came across the design, but it has endured in the queue, so maybe this will be the summer!